Popović et al. (IT-05-88) "Srebrenica"
Vujadin Popović and Ljubiša Beara sentenced to life imprisonment on 30 January 2015. Drago Nikolić sentenced to 35 years' imprisonment on 30 January 2015. Radivoje Miletić sentenced to 18 years' imprisonment on 30 January 2015. 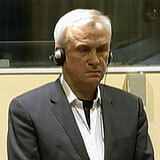 Vinko Pandurević sentenced to 13 years' imprisonment on 30 January 2015. Ljubomir Borovčanin sentenced to 17 years on 10 June 2010, trial judgement not subject to appeal. Milan Gvero sentenced to 5 years' imprisonment on 10 June 2010, trial verdict determined as final by Appeals Chamber on 7 March 2013 following the accused death.